When it comes to synchrotron light sources, brighter is better. By using bright beams in their accelerator, researchers at the Advanced Photon Source (APS) synchrotron facility can efficiently gather detailed data. In collaboration with APS engineers, Nicholas Goldring of RadiaSoft LLC creates and distributes simulation applications for designing vacuum chambers relevant to the APS. Below, find a video recording and summary of his keynote talk from the COMSOL Conference 2018 Boston. 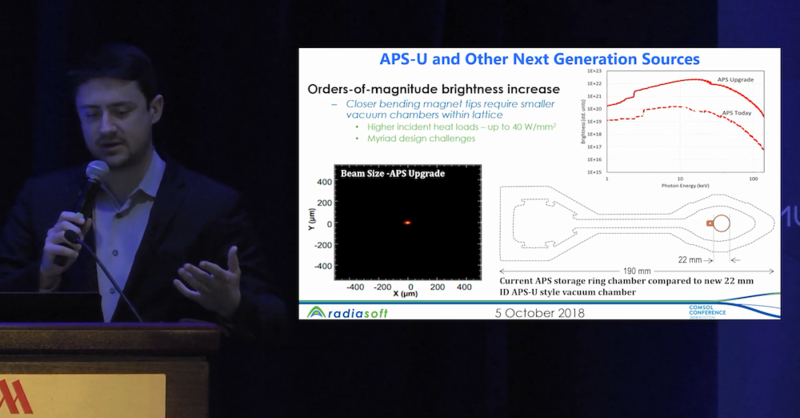 From the video: Nicholas Goldring discusses the beam brightness (top right) and vacuum chambers (bottom right) before and after the upgrade. To accurately simulate the behavior of the APS synchrotron and other accelerators, RadiaSoft creates models, turns them into simulation applications, and then distributes them to project stakeholders. 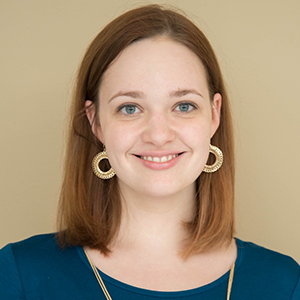 The synchrotron vacuum chamber is a true multiphysics problem, but in a typical accelerator simulation, Goldring explained that “there are many different codes […] and they are very specialized” — usually to one physical process. This is problematic because going back and forth between simulations is error prone and time consuming. As a solution to this issue, the engineers at RadiaSoft use the COMSOL Multiphysics® software for ray tracing, thermal analysis, molecular flow models, and more. After building a model, they turn it into a simulation application and distribute it using the COMSOL Server™ deployment product. This enables scientists and engineers who aren’t familiar with the codes or COMSOL Multiphysics to run their own simulations. From the video: Nicholas Goldring showing the vacuum chamber application. By deploying their simulation applications with COMSOL Server™, RadiaSoft is making it easier for scientists and engineers to test and optimize accelerator designs. This material is based upon work supported by the U.S. Department of Energy, Office of Science, Office of Basic Energy Sciences, under Award Number DE-SC0015209. 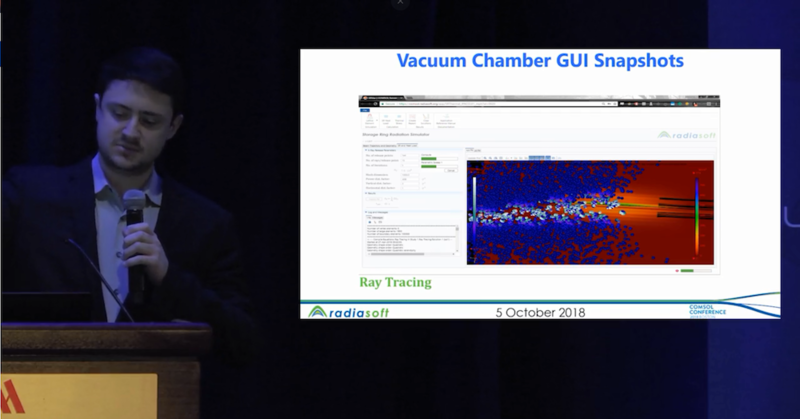 To learn more about how RadiaSoft uses multiphysics modeling and applications to improve the APS synchrotron, watch the keynote video at the top of this post and visit the RadiaSoft website.